One thing led to another. And now I have… or HAD this. BUTTER! I spent the night reading about butter-making, and was intrigued by the simplicity of it all… Just add cream and shake? Unbelievable. And do I seriously want to shake a bottle for hours and hours and hours? My arms are already sore from plucking my boy from trouble (literally) and is butter really worth losing my limbs for? :p But hey, it sounds really easy with a KitchenAid mixer. (hint). 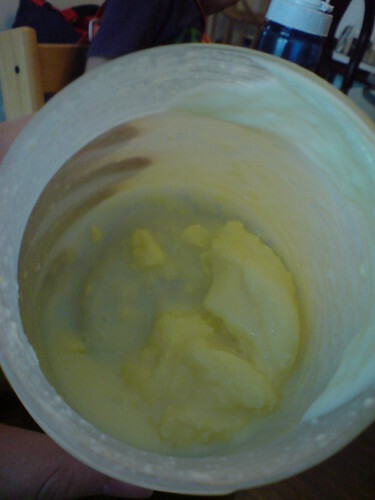 While raiding the fridge for an afternoon snack, I noticed that I STILL had that half tub ofcream left over. What the heck. I dumped the content into a plastic container that used to contain some Chinese New Year goodies, and screwed on the red lid. While lamenting this fact to my hubby & equally unsympathetic son, I noticed that the cream was curdling! That gave me HOPE. I shook some more and then I heard the legendary ‘blop’! And we’ve got BUTTER! And I only shook that thingy for less than 5 mins! There was too little buttermilk to be saved, and I yielded less than a palm size of butter. I added some honey (a little too much) after ‘washing it’ and glad-wrapped it before I left it in the fridge.